For my last sprint, everyone saw art in all categories (regardless of what they subscribed to). The mission of this sprint was to start serving different combinations of art recommendations to different people…without coding. Campaign Monitor ($29/mo) has a really awesome feature, called “Dynamic Content”. It allowed me to only email people with art in the categories they opted into. My curators spend a lot of time finding art for clients. The most time consuming part is writing paragraphs on each piece of artwork… that most of our clients never read. 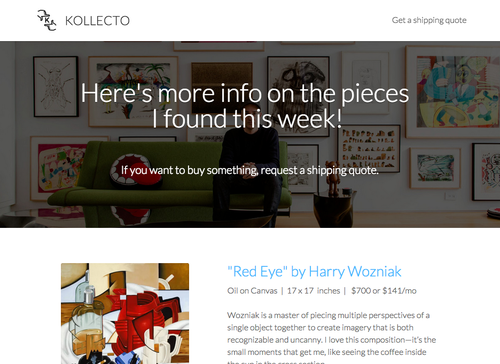 So we decluttered the art recommendation pages & started linking to a separate page where clients can get more info on pieces- only if they want to! I didn’t really have my sh*t together for this sprint. I was able to show each user a different combination of artworks in their email. But when users clicked out to the Google Survey, they still saw every piece of art that was curated for the week. Google surveys doesn’t have a code-free show/hide feature. So, again, I was worried about this. But launching anyway, confirmed my learning from the first product sprint. A bunch of people still found art they liked (rated 4 or 5) in categories they didn’t sign up for.